All week I’d been trying to consider what to cook for Saturday evening at the lake. We had a big crowd last weekend and we were looking forward to relaxing – I wanted something special to fix for The Pleasant Lady. On Saturday morning as I was still considering what I might prepare using my Anova Precision Cooker Sous Vide, I saw a facebook post by my friend John about an article on the Anova blog. 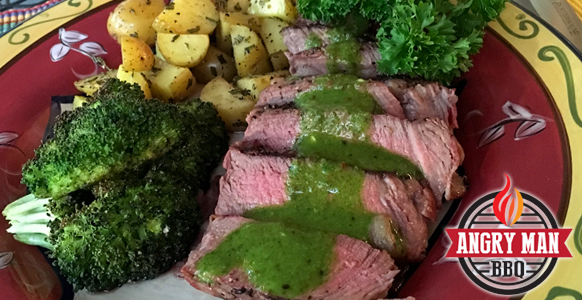 Firefighter Patrick Mathieu uses his Anova sous vide cooker to feed a firehouse of hungry coworkers and his recipe for filet mignon looked exactly like what I wanted to prepare. For me a recipe is usually merely a suggestion – just a starting point for adventure! However, I decided to follow this pretty closely with only a few necessary adjustments. 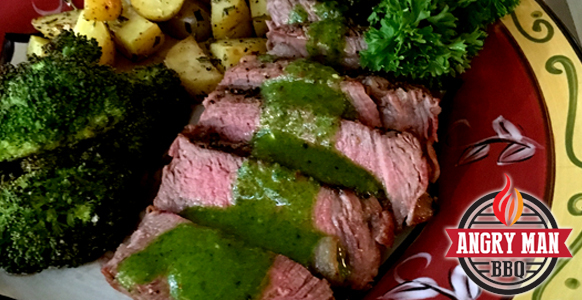 We’ve prepared filets a number of times with the sous vide method but the prep guides and recipe for the Chimichurri Sauce were worthy of following. We made a trip down to the local market for two 8 oz filets and all the herbs and other ingredients for the sauce. This was a fun cook. 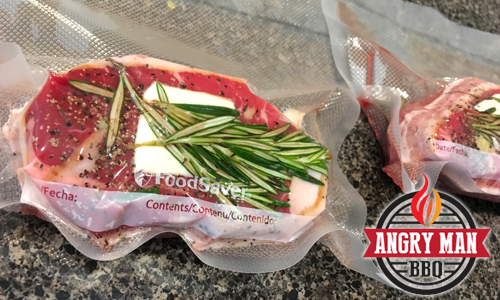 I sealed the steaks in individual bags using the FoodSaver vacuum-sealing machine. In the bag with each seasoned, bacon-wrapped steak was a nice sprig of fresh Rosemary, some crushed garlic and a bit of butter. Sure, I’ve seen arguments from both sides about whether it’s effective to season in the bag (there are those that think it’s pointless). However, I’m a believer in spicing and anyway, I would rather err on the side of spicing! We bumped the temp up a bit from the suggestion in the recipe. When cooking sous vide it is important to get as much air as possible out of the cooking bag. The FoodSaver machine and bags work great for sous vide. We often freeze meats in individual servings ready to cook with the spices in the bag. The Pleasant Lady isn’t a fan of meat that’s too pink and I’d really rather not have to adjust after it’s served….so we went to 130° rather than 125°. I’m good with that temp too. 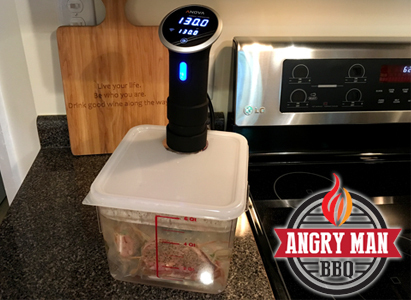 You gotta love the Anova – set the temp, toss in the bagged meat and it does all the work. I have a nice little tub I’ve rigged for sous vide cooking. The Anova Precision Cooker Sous Vide machine is a great tool You can control it from the front dial or use an app as well. We fixed a dedicated tub & top for using the clamp-on tool. The Chimichurri was where I made a couple of slight adjustments. The recipe calls for grapeseed oil for which I substituted EVOO and I substituted dry white wine for the sherry wine vinegar. These are common substitutions and I pretty much live by them. Otherwise, I followed the recipe. Looking back, I may have over-processed the sauce in the blender since mine was not as chunky as the pics with the recipe. But the flavor was unbelievable! 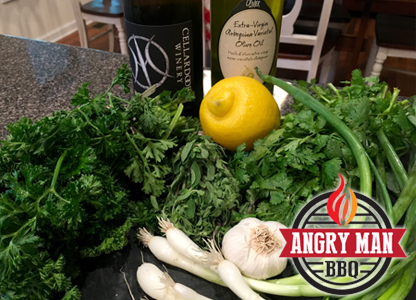 Great white wine, flavorful EVOO along with herbs & juices for the Chimichurri. 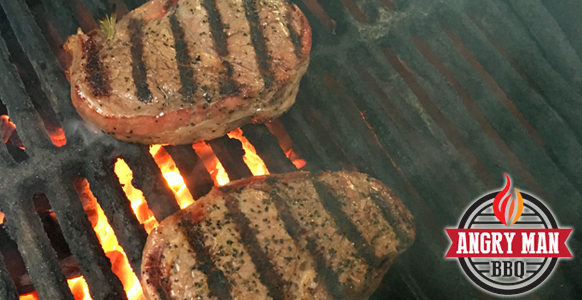 Our sear off for the steaks was done on the Big Green Egg – though any grill would serve well. I ran a dome temp of 600° and seared them for just about 2 minutes per side. I have a cast-iron grate for #1 that cooks steak well and leaves wonderful sear marks. We gave them a short rest after the searing and then sliced the steaks to serve. A quick drizzle of the Chimichurri made an impressive looking steak to serve. We seared off the steaks on the BGE at 600 degrees. We ran just under 2 minutes on each side. The Pleasant Lady had prepared golden potatoes with fresh Rosemary as well as roasted broccoli to accompany the steaks. We feasted!!! Our table on the porch overlooks the lake and she always has candles for our meals. This is one recipe that we will continue to use! I’m showing you our pics on the preparation as well as providing the link to the recipe. The deep, rich color of the Chimichurri was exceeded only by the flavor. The roasted broccoli repeated the green on our colorful plates. Hey, this was some serious good eating! Now, if you don’t have a sous vide tool then there is an alternative. My friend Chef Michael Salmon up in Camden, ME tells the story of having a class in sous vide cooking planned for one of his European foodie tours. The sous vide tool he had planned to use died just prior to the class (the US vs European voltage snafu). Well, the show must go on so Chef Michael had his sous chef stand with a pot and thermometer on the stove and he adjusted the burner while stirring to keep the water circulating around the foods they were cooking. I guess that was actually sous chef sous vide cooking. A delightful and tasty Saturday evening meal at The Angry Man BBQ Test Kitchen on the shore of beautiful Lake Hartwell. 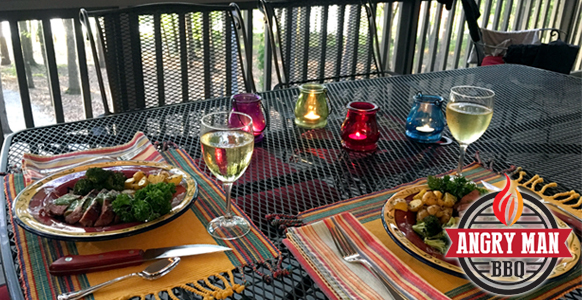 The Pleasant Lady always sets a beautiful table – even when we dine on the screened porch! Find a recipe that inspires and give it a whirl. If you are uncertain then follow the recipe exactly as written or make adjustments of which you are certain. We all need something new to enjoy in the kitchen – go for it! It will keep you from getting angry about the same old meals.